The exact phenomenon of immunization is yet to be understood completely. It is impossible for researchers to formulate a precise dog vaccine schedule because of physiological complications, mode of action, the varying immune status of each dog, side effects and difficulties in administration techniques. Some state laws and regulations in different parts of the world are another hurdle in defining an effective dog vaccine schedule. Most veterinarians follow the guidelines provided b y the American Animal Hospital Association. Researchers have managed to formulate a classification scheme for different vaccines, on the basis of their importance and epidemiological distribution of different diseases (e.g; geography). This classification includes, “core” and “non-core” dog vaccines, which should be administered according to local laws and the presence of certain risks in the environment. The goal is to individualize the dog vaccination schedule for each patient. Vaccines are also differentiated by how they are made. Some are made with live bacteria or viruses while others are made with dead viruses or bacteria. The pros and cons of each type are outlined next. It takes 7 days after the first dose to be protected or immunized (so if dose one is followed by the second dose 2 weeks later, the dog will be fully immunized after the 3rd week). Administered not earlier than 12 weeks of age. Any earlier and antibodies inherited by the mother might interfere in the process. While both types are available, the non-infectious type is considered to be safer, however, they also contain something called an adjutant. The adjutant stimulates the body's response to the vaccine so it has more of a reaction to the vaccine. The process chemicals used to kill the virus or bacteria is also a challenge to not alter the properties of the vaccine. The reason why choosing one over the other is not clear cut is that reactions to the vaccination are more common in infectious vaccines than in infectious vaccines. Dog vaccination schedule recommendations are based on the American Animal Hospital Association guide. You can download the latest AAHA Dog Vaccine 2011 guidelines here. In a dog vaccine schedule, core dog vaccines are considered compulsory for each and every dog. These vaccines are administered for immunity against Canine Distemper, Canine Hepatitis, Canine Parvovirus and Rabies. Vaccination against Canine Distemper, Canine Hepatitis and Canine Parvovirus is considered part of the core dog vaccination schedule, because of their vast epidemiological importance. On the other hand, immunization against Rabies is because of local laws or legislation in most parts of the world. A Vaccine that combines the core required dog vaccines is called DA2PP or DHPP (depending on the combination of vaccines - stands for distemper, hepatitis, parvovirus and para influenza). Canine Parvovirus - CPV-2 (MLV): All MLV-CPV-2 vaccines available today are expected to provide immunity from disease caused by any field variant recognized today (CPV-2a, -2b, and -2c). Puppies should be vaccinated every 3–4 wk between the ages of 6 and 16 wk (e.g., at 6, 10, and 14 wk, or 8, 12, and 16 wk). To minimize the risk of maternal antibody interference with vaccination, the final dose of the initial series should be administered between 14 and 16 wk of age, regardless of the product used. One dose is considered protective and acceptable. Revaccination is recommended every at or greater than 3 years after completion of the initial vaccination, regardless of the product used. Dogs (puppies) completing the initial vaccination series by #16 wk of age should receive a single booster vaccination not later than 1 yr after completion of the initial series and be revaccinated every at or greater than 3 year thereafter, regardless of the product used. Revaccination is recommended at or after 3 years after completion of the initial vaccination, regardless of the product used. 1 yr after completion of the initial series and be revaccinated at or greater than 3 years thereafter, regardless of the product used. administered between 14 and 16 wk of age, regardless of the product used. One dose is considered protective and acceptable. Revaccination is recommended every greater than or equal to 3 years after completion of the initial vaccination, regardless of the product used. Dogs (puppies) completing the initial vaccination series by #16 wk of age should receive a single booster vaccination not later than 1 yr after completion of the initial series and be revaccinated at or greater than 3 years thereafter. Administer a single dose of a “3-yr” rabies vaccine not earlier than 12 wk of age or as required by state, provincial, and/or local requirements. a “3-yr” rabies vaccine or as required by state, provincial, and/or local requirements. 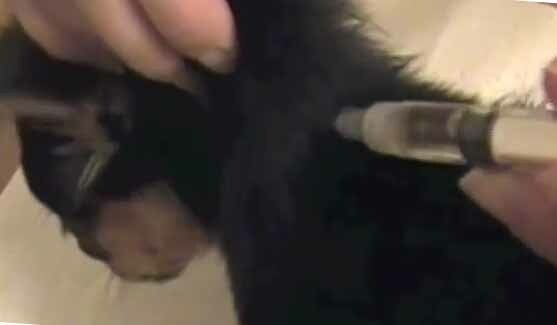 administration of the initial dose, regardless of the animal’s age at the time the initial dose was administered. Subsequently, revaccination with a “3-yr rabies” vaccine should be administered every 3 yr thereafter, unless state, provincial, and/or local requirements stipulate otherwise. The other part of possibly determining a precise dog vaccination schedule are non-core dog vaccines. Dogs may be immunized against different diseases on the basis of their potential exposure, epidemiological importance of disease, local laws, breed etc. but non-core vaccines are not mandatory for every dog. The requirements for immunization with non-core dog vaccines differ on the basis of factors such as breed, geography and epidemiology of a particular disease. Non-core vaccines become a mandatory part of a dog vaccination schedule only if exposure to certain disease is predicted. 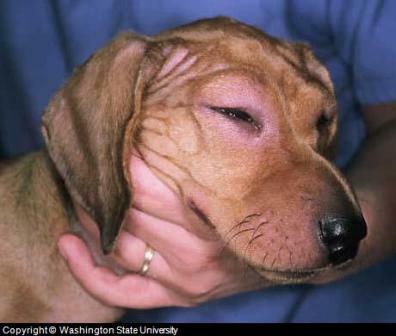 Clinical symptoms of canine influenza include a cough, nasal discharge, conjunctivitis and fever. It can progress to pneumonia and rarely death. Current hot spots where vaccine is used include New York City, Philadelphia, New Jersey, Colorado, especially Denver, and parts of South Florida. Vaccinate dogs that are exposed to race tracks, to greyhounds, or ones that are traveling in these areas.Vaccine reportedly reduces the duration and intensity of clinical signs and protects against the formation and severity of lung lesions. Give 2 doses to at risk dogs after 6 weeks of age 2-4 weeks apart. Parenteral CPiV vaccine is only available in combination with core vaccines (CDV-CPV-2 and CAV-2). Initial dose may be given at 9 or 12 weeks of age with a second dose at 2 to 4 weeks later. Initially adults get two doses, 2 - 4 weeks apart. A single dose is recommended for administration to healthy dogs between the ages of 6 and 12 wk. Not recommended for dogs older than 16 weeks of age. Measles vaccine is only intended to provide temporary immunization of young puppies against CDV (canine distemper). Given to dogs that are at higher risk. Given with vaccines for icterhemorrhagica, canicola, pomona and grippotyphosa. Dogs area vaccinated at 12 and 16 weeks with annual booster. Dogs considered candidates for vaccine include hunting dogs 1 month before hunting season. Neither the MLV vaccine nor the killed CCoV vaccines have been shown to significantly reduce disease caused by a combination of CCoV and CPV-2. Only CPV-2 vaccines have been shown to protect dogs against a dual-virus challenge. Vaccine is not recommended. There is insufficient evidence to warrant the use of this vaccine. Given to at risk dogs 7 days before exposure. Immune response lasts 4 to 6 months. Administer first dose at 8 wk of age and second dose at 12 wk of age. Two doses, 2–4 wk apart are required. Protects dogs against rattlesnake venom. Puppies get 2 doses 1 month apart. Given to puppies as young as 4 months. New vaccine that is used to prevent bacteria from causing periodontal disease in dogs (denticanis, gulae, salivosa). There are still reservations related to the classification of dog vaccines as core and non-core, but for the time being it is the most authentic and widely followed criteria for defining immunization programs throughout the world. Once, according to geographical location and epidemiological importance, core vaccines are identified, which is more effectively done by local immunization regulatory authorities and practicing veterinarians, a possible dog vaccine schedule is required to be defined. This too varies for each dog on the basis of breed and maternal immunity transmitted to a new born puppy. After birth, most dogs do not require immediate immunization since maternal antibodies are transferred, thus to enhance early maternal immunity, pregnant female dogs can be vaccinated in late pregnancy. The following is a general dog vaccine schedule, which can be suitable for any dog with minor changes. Unfortunately, even after extreme care, research and legislation there are several complications and side effects associated with canine vaccination or immunization. Complications and severity of side effects varies from dog to dog, geography, epidemiology of a disease, failure due to mishandling and by not following protocols of vaccination. Thus, it is always recommended that dogs should only be vaccinated after conducting sensitivity tests, confirming current immune status and by carefully following the manufacturer's directions. Supplementation can help in reducing adverse effects of immunization, and in most cases, natural remedies have been proven very effective to reduce stress and minor symptoms caused by vaccination. If your dog gets stressed or shows signs of anxiety when visiting the veterinarian, it might be worth discussing these types of products with your veterinarian.